Carlile's has a diverse menu, offering a wide selection of appetizers, seafood, fresh water catfish, steak, chicken, soups, salads sandwiches and desserts. We are a family friendly Restaurant & offer a child's menu. Dress is Casual. Quality is excellent, Prices are reasonable, Service is outstanding. A restaurant rich in history with an assortment of specialties, Carlile's is worth a visit. Warren Carlile started the restaurant originally known as Carlile Brothers Bar-B-Q in downtown Birmingham and kept it a family business. Numerous recipes were exchanged around town, and pretty soon Carlile's wasn't just about barbecue anymore; the restaurant catered to all parties with a broad menu. Eventually, Richard Carlile took over the restaurant from his brother and opened Carlile's in Scottsboro. From its half smoked chicken to fried oysters, Carlile's truly is a smorgasbord. Tomato pie was introduced to Carlile's in the summer of 2005 and was named the regional winner of the title “Official Dish of the Year“ by Alabama Food. 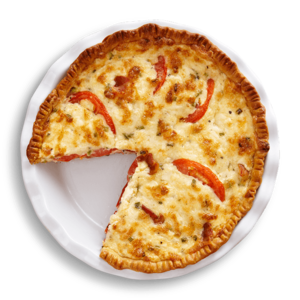 The pie ingredients seem simple — fresh basil, tomatoes and bacon. But the catch is in the topping — a mixture of mayonnaise, cheese, green onions, salt and pepper. The pie is baked for half an hour until it’s golden brown. This delicious dish alone is worth a stop in Scottsboro.